I am not at all a great lover of animals, so when I chose Animal Stories as this month's focus for the Old School Kidlit Reading Challenge, I was really pushing myself outside of my comfort zone. 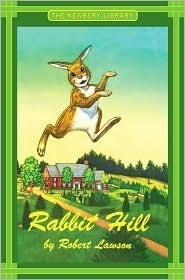 Thankfully, the first animal book I picked up this month was not a cutesy meditation on the merits of pet ownership or a thinly veiled lesson about animal rights, but a truly well-written story about a charming place called Rabbit Hill. The animals of Rabbit Hill have been on their own for quite some time, as the Big House has stood empty and the surrounding gardens have yielded no harvest. When the rumors start to circulate of "new Folks coming!" the Hill buzzes with gossip and speculation. Will the new tenants use weapons to protect their property? Will Porkey the Woodchuck be safe in a burrow so close to the house? Will there finally be enough to eat? When the new Folks do move in, it seems they will indeed be friendly toward their animal neighbors, but some of the residents of the Hill, led by elderly curmudgeon Uncle Analdas, will not be convinced there isn't something sinister at work until the Folks truly prove themselves beyond a shade of doubt. This story about the relationship between people and the animals who live on their property starts out pretty generic, but as the first few chapters unfold, the reader begins to recognize subtle hints at a more layered tale. Mentions here and there of the human beings who inhabit the areas surrounding Rabbit Hill give insight into the way people treat the animals who come onto their property, and into the ways the new Folks are different from their neighbors. The animals, too, seem to represent different points of view that people often take on themselves in situations of uncertainty. There are optimists and pessimists, conspiracy theorists and realists, those who worry constantly and those who refuse to worry at all. Though the plot seems simple, the reactions of the characters to the action of the story add a layer of complexity that elevates the book beyond a "cute" animal tale. Though Lawson clearly conveys a "kindness to animals" message in this book, I found it palatable despite my usual hatred for such themes. Part of the reason is the late-story reveal about the devotion of the Folks to St. Francis of Assisi. A love of animals grounded in religious faith is likely to be in line with the way I view animals (as sources of food, as well as sources of entertainment and companionship) and is unlikely to come at the expense of a love of other human beings. I also think Lawson's story has interpretations beyond just "animals have rights too." The real message is about generosity, and the story demonstrates how offering up some of what you have for others helps you gain their respect and love and puts in place a natural understanding of boundaries that then does not need to be enforced through violence. Rabbit Hill was a pleasant surprise. I'm very glad to own a copy, as I'm sure I will want to read it again, and I know it will only be a few years before I have school age kids who are ready to appreciate it too.